CNG: Printed Auction CNG 75. Constans II, with Constantine IV. 641-668. AR Hexagram (5.31 g, 7h). Constantinople mint. Struck circa 654-659. Sale: CNG 75, Lot: 1165. Estimate $200. Constans II, with Constantine IV. 641-668. AR Hexagram (5.31 g, 7h). Constantinople mint. 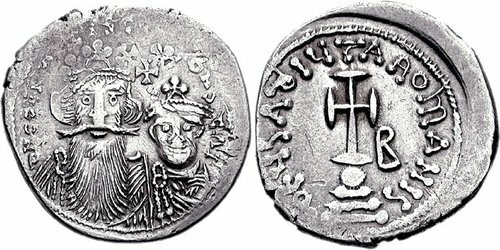 Struck circa 654-659. Facing busts of Constans and Constantine, wearing crown and chlamys; cross above / Cross potent set on globe on three steps; B//CONOB. DOC 55; MIB 150; SB 996. Good VF, lightly toned, slight double strike, typical areas of flat strike.